It’s been a year or two since I last dusted off my handy ice cream maker, and every time I gaze at its shiny, white shell (which is admittedly not often), I grow wistful for those heady days when I would pour fatty custards into its spinning innards and find glorious ice creams and gelatos waiting for me thirty minutes later. Damn, I love ice cream. I mean, I really love ice cream. Of course, who doesn’t love ice cream? Lactose intolerant people, probably. Or maybe people with six-packs. For most of us though, we all scream for ice cream, which is why I was particularly excited when a large box filled with complimentary Nancy’s Fancy gelato arrived at my doorstep last week. The creation of acclaimed pastry-chef Nancy Silverton, Nancy’s Fancy promises a luxe dessert experience, but does it deliver? And is it worth the $10.99 price tag? 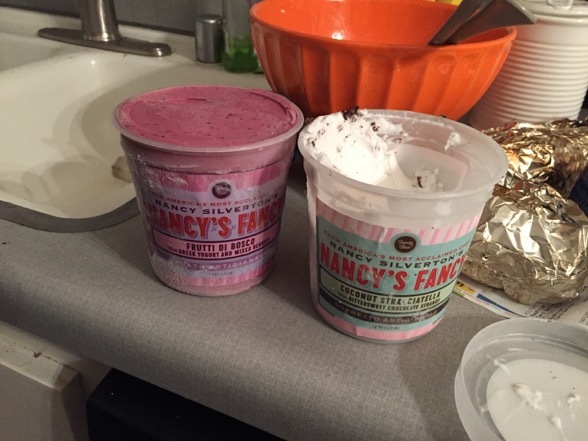 Yes, you read that correctly: Nancy’s Fancy retails for $10.99 a pint. To find out the answers to these pressing issues, I brought two pints — Coconut Stracciatella with Bittersweet Chocolate Strands, Frutti di Bosco – Greek Yogurt and Mixed Berries — to my friend’s house for a group tasting. This was all rather convenient as we were all assembling anyway to play the zombie board game “Dead of Winter.” Zombies + Nancy Silverton = an intriguing night to say the least.